In a large pot, heat the oil. Add the garlic, celery, carrots and onion and cook over moderate heat, stirring occasionally, until softened, 7 minutes. Add the tomatoes, bay leaf, lentils, smoked turkey and 2 quarts of water and bring to a boil. Cover partially and simmer, stirring occasionally, until the lentils are very tender, 1 hour. Add the potatoes and simmer until tender, 10 minutes. Remove the turkey meat from the bones and return it to the soup; discard the skin, bones and bay leaf. Add the parsley and season the soup with salt and pepper. Ladle the soup into bowls and serve, passing the cheese at the table. The lentil soup can be refrigerated for up to 3 days. 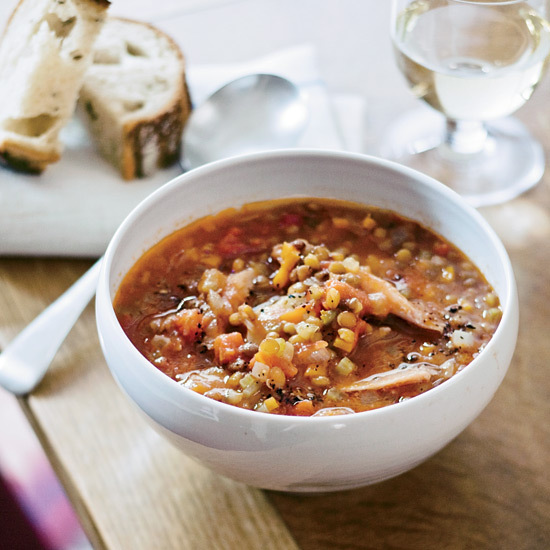 Earthy and smoky, this soup could go with a full-bodied white or a lighter red. If guests prefer white, try a Vouvray; for a red, consider an Oregon Pinot Noir. Review Body: This is a delicious soup. I modified the recipe in a few ways. Most importantly, my liquid base for the soup was a rich smoked turkey broth, not the water the recipe calls for. Making the broth took some extra time but was very easy - just boiled the whole turkey carcass, refrigerated it overnight so that I could skim off the excess fat, strained the solids out, and then used the broth in place of water. I added a can of rotel sauce and extra garlic for some zing. Also, I added into the pot some turkey I had sliced and torn into pieces earlier and did not rely on the boiled wing and thigh for meat. In addition, I used a few bouillon cubes in place of salt.